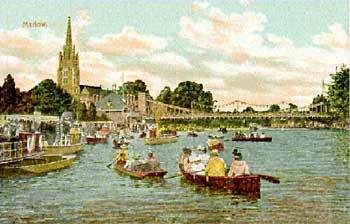 Marlow Regatta was held on June 21st, a fortnight before the final day of Henley. Every effort had been made to secure entries from Henley crews, with the result that Australian, New Zealand, and American crews figured among the contestants. The course of this old-established regatta is a pretty one, being just under a mile in length. The race for Service eight-oar crews attracted the New Zealanders and Australian No. 2 Crew, and was the best event on the programme. The Australians had been showing great pace off the mark, and during their training they were rowing very well over a mile stretch. The New Zealanders were known to be a good crew, but they had done nothing by which they could be judged. A good race was anticipated, and the Australians expected to win. They did not! At the start the A.I.F. men went away with the lead, striking a very high rate, and showing out in front immediately, rowing 41 to the minute. At about half-way over the course the Australians were about clear of their opponents, but they were rowing a much faster rate of stroke than the New Zealanders. The Australian stroke never steadied down, and in this race he asked a little more of the men behind him than they could give. The New Zealand crew, rowing a good steady 36 to the minute, crept up gradually, till at 200 yards from the finish the crews were level. Here the New Zealanders sprinted in grand style, and won a well-rowed race by half a length in 4 mins. 17 secs. The Australian crew in this event did not row up to the standard shown in their trial spins. This was due, possibly, to the fact that the rate of striking was much faster than they had previously been asked to do after the first burst off the mark. Normally, the stroke should have been steadied down and lengthened. Still, the fine rowing of the New Zealand crew must have had something to do with the stroke's anxiety to keep the lead, once gained. New Zealand—G. H. Wilson, 10st. 8lbs. (bow); A. T. White 10st. 9lbs. (2); C. L. Lester 12st., 3lb. (3); W. G. Coombes, 11st. 6lbs. (4); W. Patterson 12st. (5); S. B. R. Rutledge, 13st. (6); J. T. McRoberts 12st. (7); C. A. Healey, 11st. 12lbs. (stroke); and A. H. Trussell, 8st. 10lbs. (cox). Australia No. 2—G. W. Mettam 11st. 8lbs. (bow); G. M. Penny, 11st. 8lbs. (2); E. J. Harrison, 11st.12 lbs. (3); A. V. Scott, 12st. 7lbs. (4); W. A. Audsley, 12st. 12lbs. (5); J. K. Cogle, 12st. (6); T. McGill, 12st 9lbs. (7); H. R. Newall, 11st. (stroke); A. E. Smedley, 8st. (coxwain). The Senior Fours Race at this regatta was rowed in the coxwainless boats. Although they had very little knowledge of this type of rowing, the A.I.F. men hired a boat from the Thames Club, had a few trial spins, and decided to boat a crew from the first eight, and the crew consisted of A. R. Robb 11st. 8 lbs. (bow), S. A. Middleton, 13 St. 6 lbs. (2), H. Hauenstein 13st. 10lbs. (3), F. A. House, 11st. 8lbs. (stroke). The United States Army entered two crews, and New Zealand, Australia, Thames Rowing Club, and Granta Rowing Club one each. In the heat the Australian four were drawn against New Zealand, and after an even start showed that they had pace enough. Early trouble came from the steering, however. This was done from No. 2 stretcher, and was very erratic, and the Australians, soon after the start, fouled the New Zealanders, and both crews stopped rowing. The umpire ordered a re-start at the place where the foul occurred, and allowed the Australian crew the advantage they had when the foul occurred. The Australians thereupon went ahead and won. In their second row the A.I.F. Four rowed against a veteran Thames Rowing Club crew, and again bad steering brought disaster. After they had led over the first part of the course, the Australian steersman decided on an investigation of the river bank, and brought his crew up with a crash into a punt moored against the bank, and well off the proper course. Experientia docet! And Coxwainless Fours cannot be won without some practice! Thames Crew won the race, and they also won the final from the American Army Crew No. 1. A. S. Cox the Australian sculling representative, had his first row at this regatta, and met a fine sculler in D. C. Hadfield of New Zealand. Hadfield won his heat easily, and also annexed the final. The A.I.F. had the satisfaction of winning two of the minor events at this regatta. The emergency men of the Henley rowing party formed a crew for the Clinker Fours Race and won their heat against a crew from the A.I.F. Wattle Club, an organisation formed by the members of the Australian Headquarters Staff in London. In the final they beat Thames Rowing Club crew. The A.I.F. crew consisted of J. Howieson, 10st. 9lbs. (bow), H. A. White, 11st. 13lbs. (2), H. K. Goyen, 12st. 11lbs. (3), R. J. Clark, 10st. 8lbs. (stroke), A. E. Smedley, 8st. (cox). The A.I.F. Wattle Club won the Clinker Eights Race from the Thames Rowing Club by half a length. This regatta held a lot of interest for followers of the sport. It was expected that a good idea of form would be gained from the racing. The result, however, was a negative one, and the experts gained no information except, perhaps, that the New Zealand sculler, Hadfield, was an exceptionally good man.